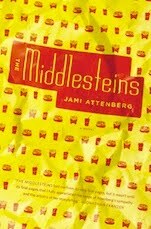 There is something so strange and wonderful about reading a novel (or seeing a movie) that is set somewhere you know well. Whether it's your home town, somewhere you spent your summers, or just a town or area you've been driving through for years, it's almost jarring to see it become the focal point of a work of fiction. It isn't necessarily a bad thing, though, and I rather like novels set in Nova Scotia, where I grew up. 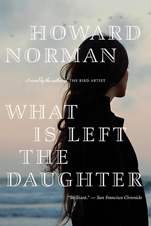 It makes me wonder about the author and want to drive the retrace the characters' steps, and in Howard Norman's What is Left the Daughter, set in the Parrsboro area and Halifax, I think I almost could. The novel is essentially one long letter from a father to his estranged daughter. Wyatt Hillyer has not been in touch with his daughter Marlais, now grown-up, since she was a baby, although he has been putting away money for her and collecting snippets of news through old friends. Things have come to a head, though, and Wyatt now feels compelled to get in touch with her. So, he sits down at the kitchen table in his parents' old house on Robie Street in Halifax to write her his life story. Wyatt's story begins in the 1941 when he is 17 and his parents both commit suicide in the same day by jumping off different Halifax bridges. The were both in love with the next door neighbour and after they both kill themselves, Wyatt is an orphan. He drops out of high school and moves to Middle Economy, on the north shore of the Minas Basin, to live with his aunt and uncle and become an apprentice in his uncle's sled and toboggan business. Once there, though, he falls in love with Tilda, his aunt and uncle's adopted daughter and Marlais' mother. The Second World War is an ever-present current running through the novel, and the presence of German U-boats just off the coast of Nova Scotia is a source of constant tension and pressure for Wyatt's uncle, who becomes increasingly obsessed. Soon the workshop walls are covered with newspaper clippings about the war and lurking U-boats and eventually he becomes so consumed he is unable to work and spends all his time listening to the radio reports about the war. With this going on at home, it was perhaps naive of Tilda to bring a German student to the community and then fall in love with him. They decide, very quickly, to get married – despite the increasing danger he is in simply for being German. But after a U-boat sinks the Caribou a passenger ferry that ran between Newfoundland and Cape Breton, all hell breaks loose. Tilda's mother had been on the ferry and was lost in the attack, and that sends Wyatt's uncle over the edge. He lures Hans, now Tilda's husband, to his house and then kills him in cold blood. Wyatt, too stunned to really understand what has happened, helps his uncle dispose of Hans' body. They both get prison terms: Wyatt's is only a few years, just long enough to keep him out of the war, essentially, but his uncle gets life in Dorchester prison. Hans' murder becomes the pivot-point in Wyatt's life. That and the birth of Marlais, which comes nine months after his reconciliation with Tilda. Essentially, the role he played in the murder of Hans has haunted Wyatt ever since, making him feel unworthy of his daughter and unable to contact Tilda. Wyatt, for all intents and purposes, seems like a nice man and although he is by no means wealthy, his job as detritus gaffer for the Halifax Harbour is steady and respectable. But he isolates himself out of grief and guilt, and as the novel progresses you realize just what an extraordinary thing it is for him to reach out to Marlais this way. His language is old-fashioned and distanced and a little awkward, but the intention of his letter is so compelling and honest that he wins you over, despite being sort of a regular guy in a lot of respects. What is Left the Daughter hooked me in first because it was set in my home province, and I am a sucker for that. But, the novel held my interest because of how Norman layers personal details over established history. He never overdoes the war details, but they build on each other until an old U-boat bobs to the surface of Halifax Harbour years after the war has ended. As a detail, it's merely interesting, but in the context of the novel, the realization that the threat was that close is horrifying. Norman's version of Nova Scotia during the 1940s (and the 1960s, when the later part of the novel is set) is a new one for me, and it's one I want to get to know better.